Performance Alerts were previously designed to enable ANYONE who needed E-mail or Text access to an alert to have the ability to receive it. A user could have enabled someone to have access to data that they had not been set up for by their Administrator. In the interest of data security this capability has been removed. NOW, an alert is ONLY sent to users who have access to the Event Form AND access to the athlete that triggered the Performance Alert. It also means you can be more flexible setting up your alerts knowing that you can multiple users to the notifications list, but only the correct users will receive a notification. Previously an alert was set to ALL users in the "Notified Users" List. Previously when you set up a Performance Alert for a group, and add a coach or athlete as a notified user who did NOT have access to that group or Event Form, they would STILL receive an E-mail or Text alerts if any of the athletes in the Monitored Athletes or Monitored Groups list triggered an alert. 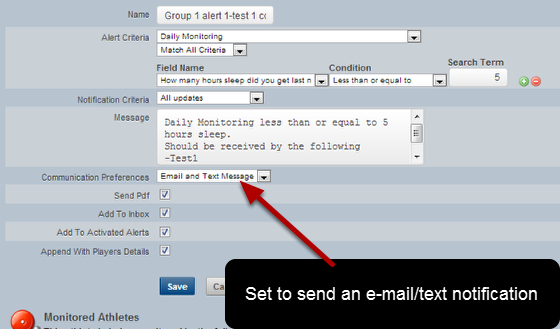 This was set up to enable training coaches who do not have access to injury record data to still receive injury alerts. It also meant that if you wanted an athlete to receive a notification of an alert you needed to set up a separate alert for each athlete who needed to receive the alert, otherwise all of the athletes would receive an alert when one athlete triggered an alert. NOW, if an alert is triggered the notification is ONLY sent to users who have access to the athlete/s AND the Event Forms that trigger the event. This means you can set up one alert to monitor a group of athletes for a new 10m personal best and all of the athletes can be included in the Notified Users list. If athlete A triggers an alert, only athlete A and any coach who is ALSO added to the Notified Users List (who also has access to Athlete A AND the 10m sprint form) are notified. None of the other athletes will receive a notification because they do not have access to athlete A's data. If a coach does not have access to the 10m Sprint form or to Athlete A they will NOT be notified. The above alert has been set up fire for the Daily Monitoring Form. -The athlete is in the group Alerts Group 1 (there are two athletes in this group, Alert 1 Athlete and Alert 2 Athlete). 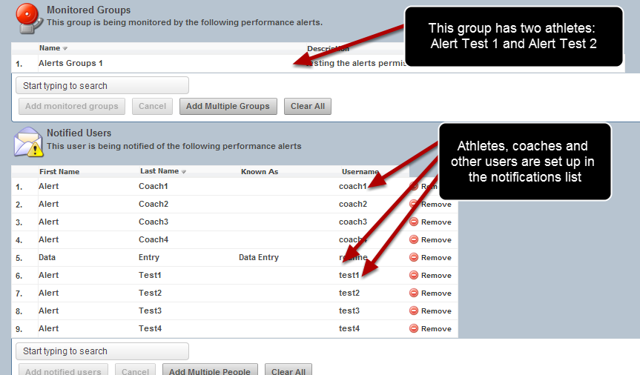 In the Notified Users section of the Alert, you can see that multiple athletes and multiple coaches have been set up as Notified Users. However, only the correct users will receive a notification. 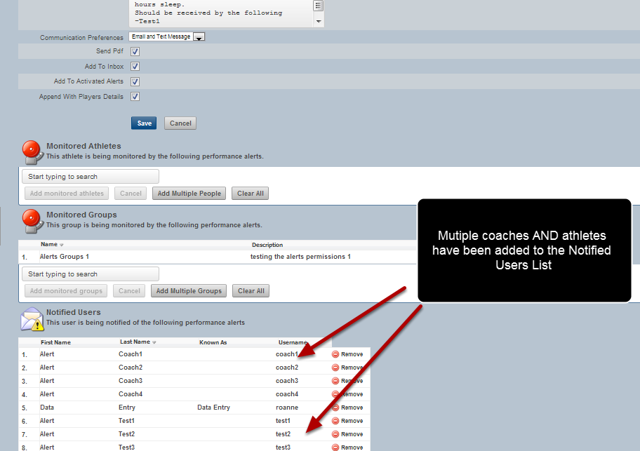 Zoom: In the Notified Users section of the Alert, you can see that multiple athletes and multiple coaches have been set up as Notified Users. However, only the correct users will receive a notification. Athlete Alert Test 1, Alert Test 2, Alert Test 3 and Alert Test 4 will ONLY receive an alert if they trigger their own alert. An athlete CANNOT receive an alert for another athlete because they do not have access to their data. -If the athlete Alert Test 1 triggers an alert, only he/she will receive the alert. None of the other athletes listed in the Notified Users List can actually receive an alert because athletes cannot access anyone elses data. -If the athlete Alert Test 1 (from Group 1) triggers an alert, only Coach 1 will receive the notification because the other coaches to not have the correct configuration of athlete access and/or coach Event Form access. If athlete 1 enters that they have had less than 5 hours sleep only 2 alerts will be sent; one to Athlete 1 and one to Coach 1. Even though 9 Users are set up on the Notification List, only 2 users will receive an alert if the Alert Athlete 1 triggers an alert. This is because athletes cannot access other athletes data and because the other coaches do not have access to the correct combination of Groups/Athletes and Event Forms. The image in the step here shows the alert that was sent to Alert Coach 1. Only this coach received the alert. If you have any question please let us know immediately. This is a significant change, but one that will enable better and more secure use of the Alerts Feature.